Posted by Qrystal on November 24, 2009 at 13:00. 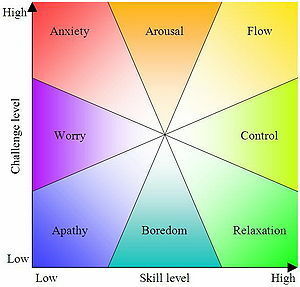 This is a diagram of mental states, as developed by Mihaly Csikszentmihalyi, showing how challenge level and skill level contribute to various mental states. I found it when looking up Anxiety, something I am trying to understand in myself.